Migrants are seen after being rescued by Aquarius, a ship run in partnership between SOS Mediterranee and international aid group Doctors Without Borders, in the central Mediterranean Sea, June 12, 2018. Italy summoned the French ambassador Wednesday in response to comments by French President Emmanuel Macron denouncing the Italian government for turning away hundreds of migrants aboard a rescue ship. Macron said Italy was required by international law to take in the migrants, who are mainly from sub-Saharan Africa. "There is a degree of cynicism and irresponsibility in the Italian government's behavior with regard to his dramatic humanitarian situation," Macron told his Cabinet, according to government spokesman Benjamin Griveaux. Italy's new Interior Minister, Matteo Salvini, told the Senate on Wednesday that France should be taking in many more migrants itself, and that Macron should move from "words to action." FILE - The League party leader, Matteo Salvini, meets reporters in Milan, Italy, May 19, 2018. Giovanni Tria, Italy's economic minister, also canceled a Wednesday meeting with his French counterpart in Paris. United Nations High Commissioner for Refugees Filippo Grandi told reporters Wednesday in Geneva that Italy alone could not be blamed for the standoff and that other countries in Europe and in the Mediterranean should do more to share the burden. The dispute highlights tensions within the European Union over how to handle the migration crisis. While Italy has taken in more than 640,000 migrants over the past five years, other EU nations have largely ignored appeals from Rome to accommodate some of the migrants. Italy's Deputy Prime Minister Luigi Di Maio dismissed France's criticism Tuesday, saying, "It is rich coming from them." Italy dispatched two ships Tuesday to help transport the 629 migrants to Spain, which unexpectedly volunteered Monday to take in the group. It was not clear when that journey would begin. An Italian Coast Guard boat approaches the Aquarius ship as migrants are being transferred, in the Mediterranean Sea, June 12, 2018. The migrants, who were picked up off the Libyan coast last weekend, had been stuck on the rescue ship Aquarius in international waters off the coast of Italy and Malta, which also denied them entry. The international aid group Doctors Without Borders, which operates the Aquarius along with the SOS Mediterranee, said the migrants were "exhausted and stressed" and warned of severe health risks to some passengers during the 1,500-kilometer journey. The Aquarius is overcrowded, so the four-day trip to Spain, in what is expected to be bad weather, will be particularly perilous. The Aquarius was headed Wednesday into increasingly rough seas en route to Valencia, where it is scheduled to arrive Saturday. To help overcome the problems, two Italian boats approached the Aquarius to take on some of the migrants before heading west through what are expected to be stormy seas. Italian interior minister Salvini, who also leads the far-right League, said his actions this week are designed to force other European countries to share the burdens presented by the ongoing influx of migrants. 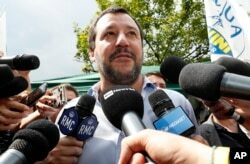 Salvini told the Senate on Wednesday that he was receptive to forming an alliance with Germany and Austria on immigration before a key EU summit later this month. Summit leaders will consider changes to EU asylum law to more effectively share the burden of incoming migrants.